Elizabeth <3! I started watching this show when the anime came out and I wanted to cosplay her right away. We planned to have a cosplay group that year, but I sadly could not make it to the con and we had to skip it. Many years later I finally got myself to sew this costume and we planned a group again. 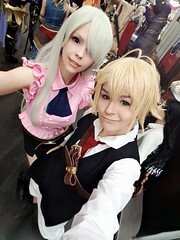 Sadly, again, life just happened and many group members had to go to work on the date, so we ended up with just Elizabeth and Meliodas. 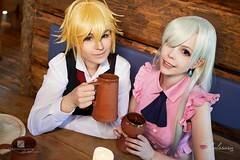 But look at my amazing Meliodas! Lux was amazing in this.It was my first time working with the photographer A&B Photography and I am happy with the results. The costume itself was easy to sew for me. I mostly used scrap fabrics, so the costs to make this were really low :).